You understandably got upset by my harsh criticism of your recent claims about the mechanisms behind the alleged anti-conservative bias that apparently so permeates the modern academy. I find it amusing that you simply assumed I had not looked at your talk and was therefore speaking without reason. Yet, I have indeed looked at it (it is currently published at Edge, a non-peer reviewed webzine), and found that it simply doesn’t add much to the substance (such as it is) of Tierney’s summary. Yes, you do acknowledge that there may be multiple reasons for the imbalance between the number of conservative and liberal leaning academics, but then you go on to characterize the academy, at least in your field, as a tribe having a serious identity issue, with no data whatsoever to back up your preferred subset of causal explanations for the purported problem. Indeed, your talk is simply an extended op-ed piece, which starts out with a summary of your findings about the different moral outlooks of conservatives and liberals (which I have criticized elsewhere on this blog), and then proceeds to build a flimsy case based on a couple of anecdotes and some badly flawed data. For instance, slide 23 shows a Google search for “liberal social psychologist,” highlighting the fact that one gets a whopping 2,740 results (which, actually, by Google standards is puny; a search under my own name yields 145,000, and I ain’t no Lady Gaga). 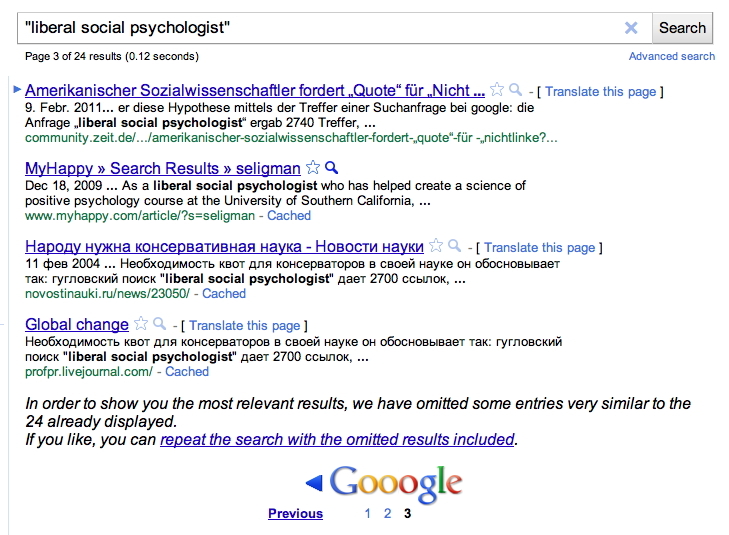 You then compared this search to one for “conservative social psychologist” and get only three entries. Voilà, case closed, bias demonstrated! Really? 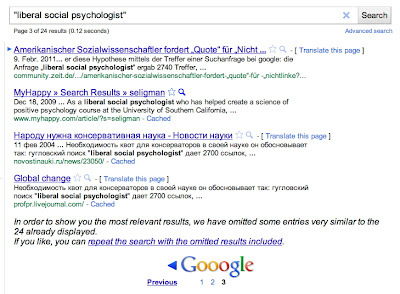 First of all, if Google searches are the main tool of social psychology these days, I fear for the entire field. Second, I actually re-did your searches — at the prompting of one of my readers — and came up with quite different results. As the photo here shows, if you actually bother to scroll through the initial Google search for “liberal social psychologist” you will find that there are in fact only 24 results, to be compared to 10 (not 3) if you search for “conservative social psychologist.” Oops. From this scant data I would simply conclude that political orientation isn’t a big deal in social psychology. Your talk continues with some pretty vigorous hand-waving: “We rely on our peers to find flaws in our arguments, but when there is essentially nobody out there to challenge liberal assumptions and interpretations of experimental findings, the peer review process breaks down, at least for work that is related to those sacred values.” Right, except that I would like to see a systematic survey of exactly how the lack of conservative peer review has affected the quality of academic publications. Oh, wait, it hasn’t, at least according to what you yourself say in the next sentence: “The great majority of work in social psychology is excellent, and is unaffected by these problems.” I wonder how you know this, and why — if true — you then think that there is a problem. Philosophers call this an inherent contradiction, it’s a common example of bad argument. Finally, let me get to your outrage at the fact that I have allegedly accused you of academic misconduct and lying. I have done no such thing, and you really ought (in the ethical sense) to be careful when throwing those words around. I have simply raised the logical possibility that you (and Tierney) have an agenda, a possibility based on reading several of the things both you and Tierney have written of late. As a psychologist, I’m sure you are aware that biases can be unconscious, and therefore need not imply that the person in question is lying or engaging in any form of purposeful misconduct. Or were you implying in your own talk that your colleagues’ bias was conscious? Because if so, you have just accused an entire profession of misconduct. You may already know that it makes a difference in Google whether you use quotation marks or not. Without them, the words need only appear in the same document, as opposed to consecutively. So, as of today, I get "About 7,600,000 results" on the "liberal" version of the string and "About 1,090,000 results" on the "conservative" version, both without quotation marks. With quotation marks, the numbers drop to 3,050 and 2,460, respectively - or from 6.97x to 1.24x in proportional terms, a big difference. But, either way, all this tests for is what folks (including Haidt, Tierney, and their commentators) are publishing to the web, according to the Google search algorithms. I strongly agree that it says little or nothing about political bias (or even self-selection, for that matter) in academia. One note -- Google results are tailored to your location and, unless you've disabled the setting, to you personally (based on your search history). Phone a friend in another part of the country and do the same search at the same time: you won't get exactly the same results. I'm in Argentina and I get 12 results (24 without omitting results) for “conservative social psychologist” and 22(46 without omitting results) for “liberal social psychologist”. But I fail to see the relevance of this other than practising google-fu. Massimo, I agree with your criticism of Haidt, mainly because his assertions and accusations (after all he is accusing the field of bias and discrimination), but I do think Haidt has a point when he took offense at your word "disingenuous" when you said he was either an incompetent psychologist (which you thought not likely) or being disingenuous in his agenda. The word "disingenuous" does imply insincerity. Insincerity is lying, after all. A different word would have perhaps been better. "Disingenuous" is a pretty strong word. lacking in frankness, candor, or sincerity; falsely or hypocritically ingenuous; insincere: Her excuse was rather disingenuous. Massimo, I found one of Haidt's biggest blind spots (were he wanting to do actual social science) was ignoring the rise of conservative alternatives to many social science societies, the expansion of new programs at religious universities, etc. I have yet to see a valid argument for why the identification of liberal versus conservative is even a valid consideration in terms of striking a balance. It seems like this could be a false balance that some people would like to see. The problem is that it is not clear that these vague ideologies should be equal in academics (or in society). Another problem is that each category is pretty diverse, so what would we like to balance here? Very good, but one nitpick: "logical possibility"? Surely you wanted to make a strong claim there, that it was not just logically possible but somewhat probable. Perhaps it was meant as comedic understatement, but it comes off as weasly. Otherwise, this response is on-target. I may be mistaken and speaking to early, but after waiting a few hours it seems that not every civil comment agreeing with your position makes it through moderation over there. Just saying: I really appreciate the openness of discussion and tolerance in the atheist and rationalist blogosphere, be it here, or at WEIT or B&W. You do not find that everywhere. Ah, I commented too early, it just took very long. Nevertheless, what I wrote is still true in comparison to many other blogs I have seen where one will be either deleted or told to go elsewhere after the first disagreement. What of those social psychologist that can not be defined as either? I do not see a problem. What is unusual or strange that science and education attracts more liberal types and business - more conservative types? Google search counts are worse than useless data (worse than useless because they are not only inaccurate, but give a misleading appearance of being accurate to the uninitiated). I've noticed this for some time, and it's described in a bit more detail on the xkcd blag. It's simply improper to compare two sets of results unless one uses the API or other tool designed by Google to be more accurate. Regarding the article more generally, Haidt seems to be mainly concerned that liberal academics are forming a moral-tribal group. There's a few odd things about this. First off, it's not clear that this is happening to such a degree that it's a serious problem. Surely a shared tribal view of themselves as intellectuals is, whether good or bad, inevitable. And surely most of them also define themselves in part by moral opposition to other groups (at a bare minimum, sociopaths and discredited groups such as Nazis and white supremacists, which most conservatives would also consider themselves in moral opposition to). The formation of a very loosely morally united tribe is not by itself a problem, especially given that the designation "liberal" still encompasses a range of views and priorities. Another odd thing about this is that, by Haidt's own research, conservatives are more prone to exclusionary tribal behavior than liberals! While this does not excuse liberals from having any concern in the matter, it should be at least be considered that the problem may not be that liberal psychologists see conservatives as a morally inferior out-group, but in fact the reverse may be the case. The question is then not about social psychologists trying to see conservatives in a better light, but instead asking the question: what kinds of steps are worth taking to improve how conservatives view social psychologists? It's an exercise in P.R. and credibility, not correcting discrimination, and is really both a more complex issue, and one that seems much more distant from the actual practice of research itself. This is especially concerning given that a lot of conservatives' dislike of science (both hard and social) is due purely to disliking the results. There's not a biology without evolution or a climatology without climate change. Similarly, there's not a psychology where being gay makes you violent and unhappy and being Christian makes you a saint, nor is there a socioeconomics where everyone deserves their station in life. To stretch out into other disciplines, there's not a true history that backs up conservative views on American history or history of religion. In these cases, if someone wants to get more conservatives into academia, it's the conservatives who have to change to fit the research, not the scholarship which needs to become more conservative. To provide a very clear example (one that supports Gadfly's argument), look at how the American College of Pediatricians split from the American Academy of Pediatrics over gay rights issues. In the face of evidence contradicting their beliefs, these people simply declared mainstream pediatrics to be a biased liberal enemy and went off to form a society affirming their own "facts", and this is a common story in conservative denials of science. What was the American Academy of Pediatrics supposed to do to retain these conservatives? Could they ignore the issue or support false controversies, and still maintain any semblance of professional integrity? Is it a dangerous moral tribalism to support and inform families with gay parents or children, without tip-toeing around conservatives' senses of moral purity or religious authority? At what price could we buy such a false sense of balance? Hmm, I really don't think I'm being Clintonesque here. And the slides in the talk make it clear that the google example was central to the argument, especially as data are concerned. But this exchange has gone on long enough, considering that it's not even about a peer reviewed paper. Why is science and its results excluded from bias in this discussion? I think that's already been proven. Has it been considered that a rational examination of the available evidence may lead to a liberal view point? And then there is the terrible anti-Republican bias among the teachers in Wisconsin.